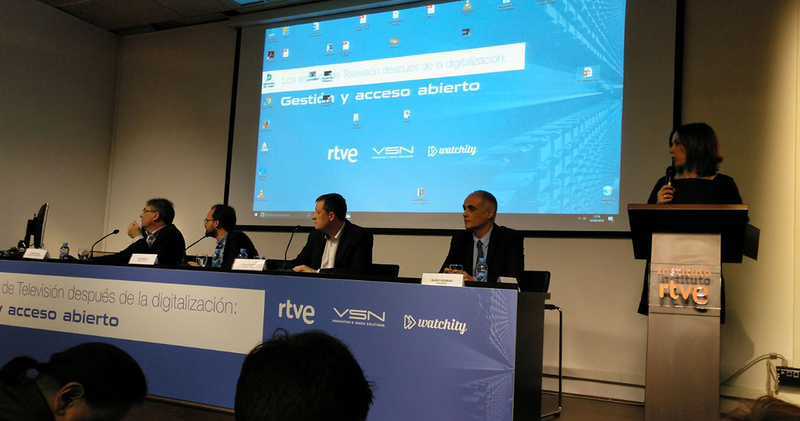 RTVE Document Archive and RTVE Institute, with the assistance of the University of Murcia, the European Communication Research and Education Association and VSN as technological partner, organized the II Seminar on Archive and TV, which took place on April 16. The experts invited to the seminar addressed issues such as digitalization, management of new video formats, audiovisual archive, copyrights or archive in the cloud. RTVE Document Archive and RTVE Institute, both part of the Spanish public corporation RTVE, with the assistance of VSN as technological partner, the University of Murcia and the European Communication Research and Education Association (ECREA) organized the II Seminar ‘TV Archive after digitalization: management and open access’. The II Seminar on Archive and TV, with Alberto de Prada, Director of RTVE Document Archive, and Virginia Bazán, Project Manager at RTVE Document Archive, taking the lead role in its organization, reached its maximum capacity a month prior to the event. This was the second seminar in the cycle of conferences initiated on October 2016 with the Seminar ’60 years of TVE Archive’, organized by RTVE Document Archive with the assistance of Universidad Carlos III on the occasion of TVE’s first broadcast. This II Seminar on Archive and TV was aimed to professionals of the audiovisual industry and designed as an experience exchange forum in order to create a cooperation network among industry professionals. Heads of Spanish and European public TV channels, representatives of universities, multinational corporations and Spanish companies from the audiovisual and telecommunications industries, such as Jordi Utiel, VSN President and CEO, Manuel Escribano, VSN CTO, and Roberto Pascual, VSN EMEA Sales Director. Throughout the four conference sessions and the final roundtable included in the II Seminar on Archive and TV program, the invited experts shared their experience with all the 150 attendees present on the premises, as well as with all the spectators that followed the event online. The speakers addressed issues such as digitization, preservation and migration; management of new video formats; audiovisual archive, copyrights and academic access to audiovisual archives; automatic metadata generation, cognitive tools and machine learning applied to TV archives, audiovisual archive management and content selection; or archive in the Cloud, web and social media.